M is for Mystery. Whether you read it or not, everyone needs a little mystery. Chiseled in Rock argues that your blog titles must be, which I thought was interesting. Do you click on blog titles that are ambiguous, give hints or spell it out for you? I click on the links that tell it like it is. I don't have time for mystery in my RSS Feed. 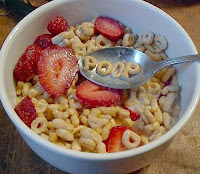 But sometimes I like it in my cereal. Should Publishing be Compared to the Music Industry? @ Rachelle Gardner. In the Future, Everyone Will Have a Chance @ Nathan Bransford. Social Networking and Your Picture @ BookEnds. 7 Ways to Learn from Conan O'Brien @ Rachelle Gardner. A Look at Literary Assistants @ Guide to Literary Agents. On Requests: Some Things to Consider... @ Babbles from Scott Eagan. You Need a Complete Manuscript @ Kidlit. Noteworthy Links: Where Pitch Paragraphs Fail @ The Other Side of the Story. It's How It's Interpreted @ BookEnds. I have a Publishing Deal but I Still Want an Agent. Here's Why... @ Guide to Literary Agents. 10 Tips for Launching a Book Without Losing Your Mind @ Stet! Culprit: Writing Mechanics @ Pub Rants. Next! Transistions @ The Other Side of the Story. Likeable? @ Dystel & Goderich Literary Management. Difficult Structural Elements and the First-Time Novelist @ Writer Unboxed. The Character of the Character @ The Blood-Red Pencil. Free FtQ Chapter: Flashbacks @ Flogging the Quill. Schedule, Schedule, Schedule @ Pimp My Novel. 3 Traits Your Hero and Villain Should Share @ Wordplay. TTYU Retro: Laughter @ TalkToYoUniverse. The title has to interest me. With so many blogs to follow I pass on a lot where the title does not grab my attention. But those with the A-Z Challenge I open, but often am unable to comment sensibly. I've been cruising the A to Z list, and, with so many blogs and so little time, I do tend to click on the titles that are clever or somehow personally relevant. But I don't want to be a blog snob! Telling it like it is - always a good thing. And so is your blog.